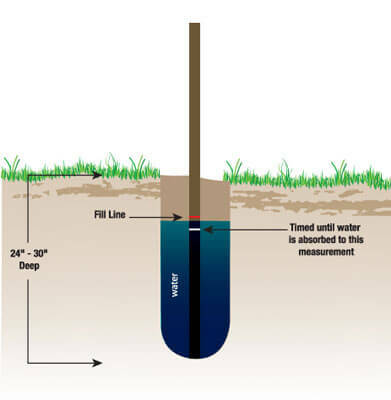 To ensure a septic system (on-site sewage treatment system) is designed specifically for the site that it is being installed on, a percolation test has to be completed prior to approval. The soil is the main ingredient to ensuring satisfactory treatment of house sewage. For example if your soil is clay, it works well to remove bacterias, but it becomes saturated easily so will require a larger septic field and cannot be buried too deep. A more coarse soil will not be very effective in removing the bacteria and nutrients in the leach field. The area to be tested is first analyzed with soil borings. The soil is them evaluated for suitability prior to the percolation test. The site chosen to install your septic system has to be large enough to accommodate the percolation rate of the soil as well as the anticipated sewage discharge from the existing or proposed structure. Other considerations are property lines and proximity to potable water supply’s. Test holes are made in several areas and mapped on the proposed installation site. Enough holes are done to ensure that the soil is consistent throughout the entire area. When the holes are dug the walls are often ‘smeared’ or smoothed by the process, making the soil less permeable. It is important that your contractor scratch the sidewalls to ensure proper testing of the soil. Not doing this can result in a failed test in what should be considered as perfectly good soil. To calculate the percolation rate there must be three consecutive percolation tests whose rates are within 10% variance of the other. These are averaged to determine the “design percolation rate” for the septic system. The recordings of these tests and locations are included as part of your site evaluation and required for your permit. Designing the size of your septic system and properly sized soil treatment unit includes the estimated amount of sewage waste. As mentioned above the number of bedrooms is one factor but so is the number of residences, and type of residence. The design must factor in appliances such as washers, dishwasher, garbage disposals, water softeners, jacuzzi’s, and de-humidifiers. Other considerations are home business setup’s such as B&B, daycare, and auto-detailing. Proper location of your sewage treatment system requires knowing the soil texture, direct water table, slope of the land, and existence of soil mottling. Two main types of soil are organic and inorganic (mineral) which is comprised of a mixture of decayed animals and foliage and weathered minerals. Organic soils is made of decayed plants and is vound in marshes, bogs and swamps. When dry, these soils are light in weight. Air and water can vary with the amount of precipitation and the frequency. It is the amalgamation of all four that establishes the likelihood that the soil is adequate for the proposed building site. Brown or red indicates a well draining soil. Gray indicates a poorly drained soil. Spots of gray, red, and brown indicates mottled soil and the area is likely saturated during wet seasons. When you are designing a new home on an undeveloped lot there are many considerations when deciding on location of your home, property drainage, and septic system. It is important that the land you select will accommodate the home you are planning to build.